NEW Zealand bills itself as the youngest country on earth and the vibrancy and energy which informs the Kiwi attitude gives some credence to that claim. 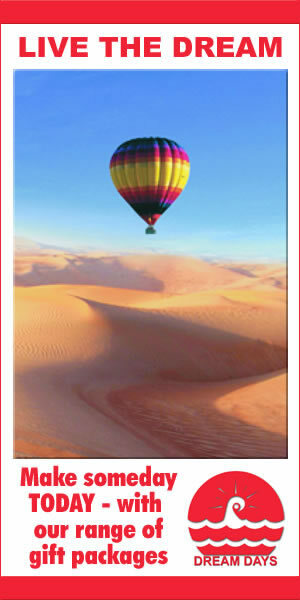 This is a country which revels in the outdoor lifestyle - and using its scenery to provide ultimate thrills. This is, after all, the birthplace of bungy-jumping. It’s also a country which is immensely proud of its heritage (and whose treatment of its indigenous peoples compares favourably to Australia’s somewhat ambivalent relationship with the aborigines). Consisting of North and South islands, there is a dramatic contrast between the more populous north and the rugged landscapes of the south. North Island is where most tourists will start. 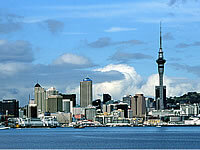 At first glance Auckland, the nation’s biggest city, could be any other metropolis on the planet. It has the same skyscrapers, multi-national presences and brands. But stay a while and its subtleties reveal themselves bit by bit. There’s a feeling of spaciousness you don’t usually find in a city. The best place to get an overview of Auckland is from the top of the Sky Tower, the tallest free-standing structure in the southern hemisphere. If you’re feeling very brave, you can look through (and step on) the glass bricks which dot the floor of the upper platform. They’re built to withstand the weight of an elephant, apparently, though that might not be a comfort if you’re not good with heights. If you feel in need of a rest after that excitement, go down to the Sky Tower’s cafe level, where you’ll be entertained by bodies flying past the window. This is the Sky Jump, a sort of cross between bungy and base-jumping. Cables control the descent rate of the jumpers and at the same time prevent them from being blown into the side of the tower by crosswinds. For something a little tamer, though still as entertaining, try Kelly Tarlton’s Underwater World. This aquarium in the Mission Bay suburb is built in a set of former sewage storage tanks, which now house thousands of fish. But you’ll never see the real New Zealand if you stay in the cities. The Bay of Plenty region, just south of Auckland, has great charm with its rolling coastline and easygoing seaside settlements. 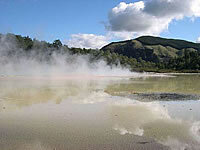 It’s also where you’ll find the most dramatic examples of geothermal activity - something New Zealand is noted for. Around the Rotorua region you’ll find plenty of opportunities to gawp at geysers and watch boiling-hot mud bubble pensively. The geothermal goings-on have also led to a burgeoning spa industry in the Rotorua area. It’s also here that you’ll find some of the best examples of New Zealand’s Maori heritage, particularly at the Tamaki village, where you’ll be greeted with the “hongi” - the traditional Maori greeting of touching noses. While you’re in the Rotorua area, you’ll want to go to the New Zealand Agrodome to have a look at New Zealand’s most famous export - sheep. Three times daily the Agrodome hosts the bizarre but fascinating Sheep Show, which features a “beauty parade” of nineteen different sheep breeds as well as a shearing demonstration. You can also tour the organic farm and the more energetic can sample yet another Kiwi extreme sport. Zorbing involves climbing inside a huge transparent sphere and being pushed downhill. You can have a “dry zorb”, where you’re strapped in for the experience, or for the more adventurous (or mad) how about a “wet zorb”, where you’re left to bounce around inside the sphere with a couple of bucketfuls of water for company. If you’ve ever wondered what it would be like to climb inside your washing machine, this is the place to find out. Among New Zealand’s most notable exports are its impressive wines and one of the best areas for sampling it at its origin is the Hawkes Bay region on North Island. It also boasts one of the sunniest climates in this temperate region, with 220 sunshine hours per year. Auckland may be the biggest city in New Zealand, but its capital is Wellington, looking out on the Cook Strait which divides it from the wilder south. Wellington is known for its windy weather, so come prepared. It’s also blessed with a harbour setting perhaps only exceeded by Sydney for its beauty. If you only do one thing in Wellington, drive or get a bus to the summit of Mount Victoria and look down on the spectacular harbour view. Your ferry to South Island awaits - and that’s where we’ll head next time.